Мировая пресса о российских производителях освещения для птичников. В самом авторитетном издании по светодиодной технике «LEDs magazine» опубликован релиз о достижениях российской компании «Резерв» в использовании светодиодов для освещения птичников. Светодиодное освещение для бройлерного птичника. The Russian company Reserv Ltd actively introduces LED lighting systems in agriculture. The specialists of the company developed lamps to be used for lighting of houses with different types of bird keeping. Poultry farming is a very specific sector of agriculture, there are particular demands for lighting systems, such as: lamps should be waterproof, have the possibility of changing the brightness from maximum to zero, guarantee optimal heat rate for LEDs in the conditions of intense dustiness and the ambient temperature till +35 C.
The company Reserv Ltd organized successfully production of LED- lamps that satisfy strict requirements of poultry farmers; nowadays tens of poultry houses in Russia are already equipped with this innovative lighting system. 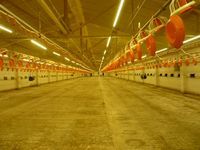 As a unit with lamps the company Reserv Ltd also offers lighting controllers, that allow to keep up automatically necessary illumination in poultry house during all period of birds keeping. Системы освещения от OSRAM пополнятся новой продукцией.